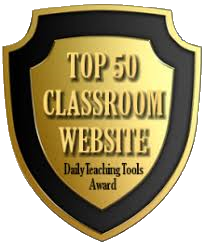 The sites listed here are those most often used in class. QuizStar is a digital quiz platform. Student will be given a user specific ID and pass word. I often assign "quizzes" on this site. Students may use their books, notebooks, encyclopedias, and other source material to complete these assignments. EasyBib helps studnets create bibliographies and works cited pages. A Free Countdown Timer - When a Stopwatch just will not do! This Online countdown is very easy to use - and like all our timers, it's totally free :-) A Simple, Fast Flash Countdown Timer always available when you need it. DROPitTOmrwoodmansee, is my drop box. Often, I give assignments that will need to be submitted in both paper and electronic form. The upload pass world is "mrwoodmansee". EduCanon is an online learning environment to create and share interactive video lessons and transform what is traditionally passive content into an active experience for students. Kidblog is designed for K-12 teachers who want to provide each student with an individual blog. Students publish posts and participate in academic discussions within a secure classroom blogging community. Teachers maintain complete control over student blogs and user accounts. Paste your text into Analyze My Writing and it will generate a ton of information about your writing. Analyze My Writing will give you a break-down of the readability of your writing on five indices. The analysis will include listings of the most common words and most common word pairs in your writing, a list of punctuation usage, and a word cloud showing common words. Plagiarism Detector is a free plagiarism checker. Like all free things it is not perfect, but it is still helpful to check. Free alternative to Microsoft Office Word, Excel, and PowerPoint. Many schools, offices, and non-profits use this software, including St. Joseph's Parish. Visuword is an online graphical dictionary — Look up words to find their meanings and associations with other words and concepts. Produce diagrams reminiscent of a neural net. Learn how words associate. Vocabulary Spelling City provides spelling, vocabulary, writing and language activities for K-12 cross-curricular word study. Use this link to access Mr. Woodmansee's word lists. Create graph and charts online quickly. ChartGo is a graph maker tool. Simply follow these steps; pick your settings, paste your data and click the create button. MapStory is a free tool for creating mapped displays of data sets. Data sets that are time based, the travels of Genghis Khan for example, can be set to play out in a timeline style on your map. Create a "fake Facebook" page. This will be used in social studies class. Woodmansee's review game can be used with any simple board game to review for any content area test or exam. For students who use Apple products at home sometimes run into trouble saving and using files created at school. This tutorial may help. Another adapted game by Mr. Woodmansee. This one takes a little bit of prep on the part of the leader. First print a simple outline map and label the locations. Be sure to add water passages connecting islands and continents. Not every location should connect to a separated land, similar to the actual risk game. I like to place the printed map in a sheet protector, but you could accomplish the same effect with colored pieces as an"occupying force". AdoptAClassroom.org gives teachers a hand by providing needed classroom materials so that students can succeed. Since they were founded in 1998, AdoptAClassroom.org has connected thousands of donors with approximately 100,000 classrooms. They have raised close to $20 million and estimate that they have improved the learning environment for 3.5 million children with 100% of donations going directly to the classroom.